Malaysian police fired tear gas Friday at supporters of an opposition leader who was forcibly removed from his office when he refused to cede his post as chief minister in a political tussle over which party controls the state’s legislature. Perak was one of five states in the hands of Anwar Ibrahim‘s three-party opposition alliance. But National Front lawmaker Zambry Abdul Kadir was sworn in as the new chief minister Friday. Thousands of opposition activists (photos) breached a police barricade earlier in the day in a bid to march to the Perak royal palace to block Zambry’s swearing. 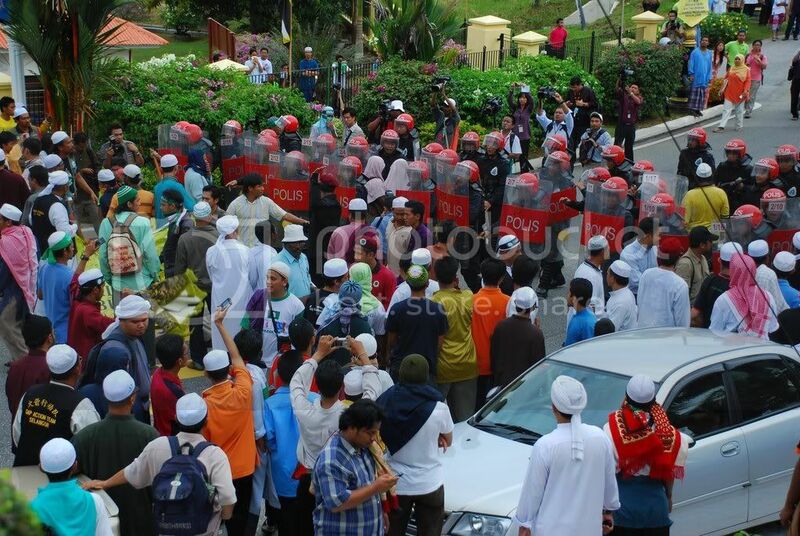 Police responded by firing tear gas, and the protesters retreated into a mosque, said the Malaysiakini news Web site. It said about 10 people were arrested. Police could not be immediately reached for comment. Losing Perak is a slap to Anwar’s alliance, which won an unprecedented five of Malaysia’s 13 states in general elections last year. “Such a takeover (in Perak) is really a big blow to democracy and insults the wisdom of the masses,” Anwar told The Associated Press, and called for fresh elections. Earlier Friday, police escorted ousted Chief Minister Mohammad Nizar Jamaluddin from his office when he returned to work and refused to leave. Mohammad Nizar said he would only quit if he is removed by a vote of no-confidence in the state assembly. “As far as we are concerned, this is the legal government,” he told reporters before the swearing in of his successor. Mohammad Nizar’s ouster and the takeover of the state government by the National Front was endorsed by Sultan Azlan Shah, the influential hereditary ruler of the state. Following the defections, both sides have 28 seats in Perak’s 59-member legislature, but the National Front claims it effectively has control because the three independents would back it in any vote.